DECIBELS and excitement were high when a mighty convoy of tractors roared up the leafy avenue of Knockbeg College and pulled to a halt outside the front door. It’s not many bastions of education that would allow their students to drive agricultural vehicles to school, but Knockbeg has a long-standing tradition of doing just that! It’s the students themselves who organise the traditional tractor run and it’s a massive source of pride for them. Their assembled John Deeres, Masseys, Valtras and New Hollands were all gleaming after the young drivers had scrubbed and polished their tractors for the event. It was an early start for the 11 drivers and their passengers when they congregated at Pedigree Corner in Co Laois at 7.30am one foggy morning in late March. But a little bit of wispy fog wasn’t going to put off the hardy bucks and soon they were on their way, touring the byways and back lanes before they eventually arrived at the gates of their alma mater. 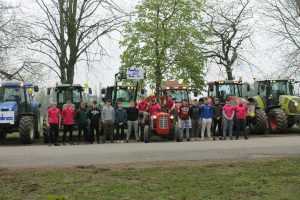 The tractor run is traditionally a fundraiser, so this year the boys very kindly chose an organisation called Embrace Farm, which does brilliant work acting as a support network for families suffering from farm bereavements and people involved in accidents. Money was collected from students during a non-uniform day, while parents also rowed in with donations during their school runs. As a result, an impressive €1,200 was raised, which will go directly to Embrace Farm. The sixth-year students who organised the event would like to thank their supporters and sponsors, including the Kelly family from Stradbally, Byrne’s Joinery and Kelly’s from Laois. “It was a brilliant day to carry on the excellent tradition and a nice way to keep all the farmers in the school happy, for a day at least!” quipped one of the organisers.